Written by Becky Botzet, CFP®, EA on 15 March 2018 . According to the U.S. Department of Health, 70% of people 65 and older will need some kind of long-term care eventually. It is also reported that although nearly one-third of today’s 65 year olds may not ever require long-term care or assisted living, one out five (20%) will need it for more than five years. The costs vary depending on the degree of care, see below for the median costs. The average length of a nursing home stay is between 2½ to 3 years. Diagnosis of Alzheimer’s Disease could result in a much longer stay. You should also know that Medicare does not cover nursing home care except for limited stays after a hospital admission of three days or more, nor does Medicare pay for in-home care if it’s not skilled nursing care. The question is: Can you afford your own long-term care if the situation rises or should you consider long-term care insurance? The decision to purchase long-term care insurance is very specific to your own situation. As a general rule, we don’t typically recommend you insure the full amount of your anticipated cost. Consider that in a nursing home you will not have the other normal day-to-day expenses that we typically include in your retirement projections, such as vehicle expenses, travel and food. You will continue to receive Social Security and pension benefits to help cover costs. 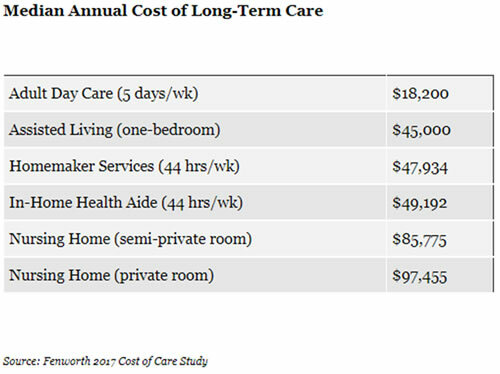 The cost of long-term care insurance varies greatly. Even with the same exact situation, the cost you could get quoted with one insurance carrier can be significantly higher than another. As we recommend as with all types of insurance, work with an independent agent who specializes in long-term care and can shop many insurance companies for your best fit. The American Association for Long-Term Care Insurance recommends the ideal age to look into long-term health care insurance is between the ages of 52-64. As with most insurance policies, there are many variations of coverage, such as individual or shared policies, daily benefit amounts, inflation riders, and varying maximum lifetime benefits. These factors, along with your current health and health history, will all determine the cost. Long-term care insurance premiums range in the thousands per year, so it’s important to weigh the cost to the benefit and the risk. As mentioned above, every person’s situation is different so it’s important to consider your options and the impact of your financial plan. Written by Matt Wright on 09 February 2018 . Most global stock markets had been on a rather astonishing run of low volatility since February 2016. Gains from stocks during this period were not unusually high for a bull market, they were just unusually steady and price dips were infrequent, small, and brief. We advised in our year-end commentary just a few weeks back: "Please don't count on a repeat this year." Lo and behold, volatility among stock and bond markets around the world have spiked higher in the past 10 days. Our cautionary comments were not intended to be clairvoyant – we did not have any specific prediction of what the financial markets would do. We just know from history that calm markets can break without advance notice and for reasons that may not be obvious. So what do we know about the recent action in the markets? The primary issue appears to be what is often called a "growth scare." As opposed to a recession, a growth scare is a concern that investors have when there is potential for the economy to become overheated, resulting in higher inflation. This causes interest rates to rise and bond prices fall, which then feeds into competing investments such as stocks, causing them to fall as well. While the overall growth rate of the U.S. economy remains historically below average, the proximate cause of the growth scare is the very low level of U.S. unemployment. The job market has tightened considerably in recent years but is just now pointing towards the possibility of rapidly accelerating wages. While your first thought might be that rising wages sounds like a good thing, it certainly can raise the risk of inflation, which is a potential problem in the long run. What is SWA doing about this market volatility? We're not actually doing anything different than we were before. Our primary stance is to make sure our clients were invested in a risk-appropriate strategy beforehand since we know that markets can't be timed. In addition, we use portfolio monitoring software that allows us to review client allocations on a daily basis and rebalance them when they have drifted far from their target weightings. In recent months, we trimmed stock exposure in many of our client accounts due to the healthy gains we'd seen up until the end of January. Maintaining the target allocation on an ongoing basis helps to reduce downside when the risk inevitably shows up. And speaking of risk, our view is much more focused on avoiding permanent losses than intermittent ones than can be recovered. Because of that, our investment choices could be accused of being too boring at times. We aim for what we consider to be reliable long-term growth vehicles and stay away from unproven and/or speculative opportunities that may be highly rewarding but come with excessive risk. For example, a hot strategy in recent years of buying "short volatility" products has cratered in the past week. One product that had phenomenal returns as recently as last month had a breathtaking drop of over 95% in a single day. Investors (gamblers) who had made "easy" money in the past learned that it was a little harder than they thought. SWA does not believe a little extra upside is a good trade for a whole bunch of downside. Written by Jon Govin on 08 January 2018 . According to Kiplinger's magazine, Minnesota is ranked FIRST...as the least tax friendly state for retirees. Unfortunately, first is not a good thing in this case! To be clear, when we are talking tax, we aren't limiting this to income tax. Retiree tax friendly considerations include: Income tax, sales tax, inheritance tax and property tax. As those who live here know, taxes can be quite steep, even prior to retirement. Individual state income taxes start at 5.35% and rather quickly move up to 9.85%. Average state and local sales taxes are 7.27% (although, food, clothing, and prescription and nonprescription drugs are exempt from state sales tax). Social Security income is currently taxed in Minnesota—one of 13 states who tax this. Recent state tax legislation exempts a portion of Social Security income (Kiplinger's did not pick this up). Other income that Minnesota taxes, that many states don't, includes: Pensions, distributions from individual retirement accounts and 401(k) plans. And, topping it off, Minnesota is one of 14 states with an estate tax (6 states have inheritance taxes). Property taxes are high but compared to our neighbors to the east (Wisconsin), not too bad, especially when considering state property tax refunds based on income. Just for the record, rounding out the top 10 least tax friendly states for retirees on Kiplinger list: Connecticut, Kansas, Vermont, Nebraska, New Mexico, Utah, Maryland, Indiana, and drumroll please..., Wisconsin. So, if you are looking to make a short move east across the border to ease the tax burden, think again. But wait, before you reserve your U-Haul trailer to push off to a more friendly tax state, consider a few things. Don't let the "tax tail wag the dog." The choice to live in one state versus another, especially in retirement years, has a lot to do with other factors. Factors beyond tax that rank pretty high include: Healthcare availability, cost of living, climate, social interaction and basic quality of life. Again, remember that the rankings are in regard to taxation for retirees, specifically tax factors for retirement income (pensions, Social Security, retirement account distributions, etc.) And folks who just look at income taxes may be surprised when they see a very steep property tax bill or find that food and day-to-day spending jumps due to high sales taxes (see below for a sample list of "taxes"). As many of you look toward retirement, you may be looking at places you may want to snowbird to or permanently move. In a future blog, we will look at states that may be a bit more appealing, from a tax standpoint. The top choice may surprise you. We are curious to hear your thoughts on what you think is appealing when considering relocating, snowbirding, or just getting away for an extended stay. Written by Bruce Primeau on 07 November 2017 . For 2018, the federal estate tax exemption is rising to $5.6 million per person while the top federal estate tax rate remains at 40%. The estate exemption portability remains in place meaning (at least for now) that if the deceased spouse does not use his / her $5.6 million exemption, the unused portion transfers to the surviving spouse. The annual exclusion amount for gifts made in 2018 is increasing to $15,000 per person or, for married persons, they could give up to $30,000 per person without having to file a gift tax return. For Minnesota residents, the MN estate tax exemption is scheduled to increase to $2.4 million per person in 2018. Note however that the MN estate exemption is not portable like the federal exemption is. If you have any questions about how the above estate tax changes will impact you, please contact us to discuss. Written by Jon Govin on 31 October 2017 . Minnesota recently introduced a 529 benefit this year that will help just about everyone who contributes to a 529 plan and not just the Minnesota 529 Plan. However, this benefit applies only to Minnesota taxpayers. Minnesota taxpayers contributing to a 529 plan have the option of claiming either a tax credit or deduction for contributions to any state's 529 plan, depending on your adjusted gross income. Minnesotans can only claim one of the two benefits in any given tax year, and the benefit phases out as taxpayer income increases. Take a credit: A credit can be claimed on half of contributions up to $500, subject to phase-out starting at a federal adjusted gross income of $75,000. The credit is reduced by any withdrawals made by that taxpayer during the taxable year. The tax deduction is pretty straightforward, and works much the same as other deductions. The trouble comes in interpreting whether a taxpayer will benefit more from the deduction or credit when they fall in between the income brackets, because the language of the legislation is confusing, at best. The wording reminds you of those dreaded "word" problems in your elementary math class. Thankfully, if you have adjusted gross income below $75,000 it is pretty simple, take the credit. Beyond adjusted gross income of $75,000 the math (and rules) gets a bit more complicated. You will need to rely on your tax preparer to calculate the most beneficial outcome for your circumstances. Of course, we will pay particular attention for the deduction or credit in our review of tax projection and tax returns of our clients that we know are contributing to 529 plans. The bottom line is that it is advantageous for Minnesota taxpayers to contribute to a 529 plan this year. If you are unsure what to do, talk to your tax preparer or financial advisor who should be well versed in tax laws. Following the Equifax Data Breach, How Safe Are Your Assets?